This a question that comes up frequently with new authors. For many, it’s a subject that’s all too often shrouded in confusion. Depending on where in the world you come from, or what route you take to get published, obtaining an ISBN can cost anywhere from nothing to literally hundreds of dollars. In many cases, there’s only one source of ISBNs and this source is NOT cheap – especially if you are buying your ISBNs individually. If you believe you need an ISBN not only for multiple books but for multiple versions of the same book and/or for each individual format of the book (PDF, MOBI, ePub, etc. ), then this can add up quite quickly. However, it needn’t be as expensive as you may have been led to believe. I’ll explain what ISBNs are for and then I’ll tackle why you need one and when. ISBN stands for International Standard Book Number. It’s a 10 or 13-digit number that uniquely identifies books and book-like products (think of things like physical books, autiobooks, etc.) published internationally. It’s a way to uniquely identify one book over another. There are various reasons why it’s necessary to track books and to be able to distinguish them from each other. There may be many different books that have the same title, for example. If you are searching for a book, you need a way to uniquely identify the one you want. The ISBN is one way to do this. How do I obtain an ISBN? The principal distributor of ISBNs is Bowker. Depending on which country your in, the name of the distributing body might be some variation on this name. For example, here in Australia, ISBNs are distributed from Thorpe-Bowker. If you are an independent author and publishing your book yourself, you may be able to obtain a free ISBN from whomever it is you are publishing your book through. In some countries, like Canada, you may be able to obtain an ISBN for free but in others you have to pay Bowker. Like most things, ISBNs become cheaper the more of them you buy. If you have to purchase a single ISBN through Bowker, you may be paying $125. For a block of ten, it’ll cost you $250. For $575, you can get a block of 100, and so on. This is highly misleading and may lead you to believe you need more ISBNs than you actually do. It’s perhaps not surprising given the monopoly Bowker has on ISBNs. It’s in their best interest after all to sell you as many ISBNs as they possibly can. However, you DO NOT need ISBNs for all these situation. An ISBN (International Standard Book Number) is not required to publish content with Kindle Direct Publishing. Once your content is published on the KDP website, Amazon.com will assign it a 10-digit ASIN (Amazon Standard Identification Number), which is unique to the eBook, and is an identification number for the Kindle Book on Amazon.com. If you already have an ISBN for your eBook, you’ll be able to enter it during the publishing process. Do not use an ISBN from a print version of your book; eBook ISBNs must be unique to eBook versions. You can purchase an ISBN from multiple sources on the Web, including the official ISBN body. Can you buy an ISBN and use it to associate with your eBook? Sure. Is it necessary? Absolutely not – although there is one exception, which I’ll now explain. Do I need an International Standard Book Number (ISBN)? No, an ISBN is recommended but not required for any book you are offering on the iBooks Store. An ISBN uniquely identifies the book and its current edition, and helps you to ensure that you are marketing the right book. The ISBN is also required for reporting your book’s sales to industry reporting agencies and charting organisations. What Apple are saying is that if you want sales data to be reported to industry sales reporting agencies, then you need an ISBN associated with your eBook to enable this. That may be true enough BUT the big five eBook retailers, Amazon, Apple, B&N, etc., all have their own sales reporting mechanisms and the chances are you’re not even going to bother with the industry sales reporting mechanism. If you are going to rely on these industry reporting mechanisms, and I can’t see why you’d ever want or need to, then you will need an ISBN for your eBook. To date, I’ve not seen a compelling argument for this. My book is published through Amazon, for example. If I want to know what sales of my book are doing, Amazon provides me with a portal that provides up to the minute data. I simply cannot get that elsewhere. I don’t need an ISBN at all to take advantage of the sales data that Amazon provides. You don't need an ISBN number to publish your Kindle book. During the publishing process, Amazon will assign a 10-digit ASIN (Amazon Standard Identification Number) that will identify your Kindle book on Amazon.com. Once you publish, you can find your ASIN under the "Title" column in your Bookshelf and in the Product Details section of your book's detail page on Amazon. If you already have an ISBN for your Kindle book, you can enter it on the book content page when publishing in KDP. However, the ISBN will only be used as a reference. Only the ASIN will appear on the detail page for your book. You can purchase an ISBN from multiple sources on the Web, including the official ISBN body. We don’t require ISBNs for eBooks, but having an ISBN will ensure a lower VAT rate for sales of your book in Italy. 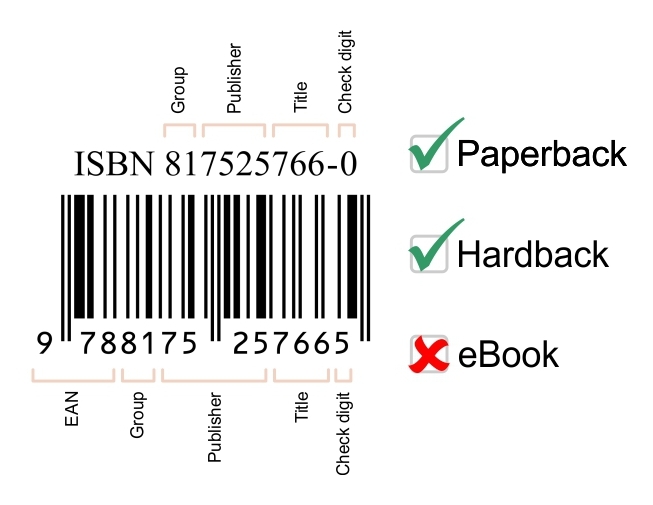 It seems pretty clear that ISBNs are not really needed for eBooks. It may be that Bowker and other industry reporting agencies can provide more accurate data on the state of the publishing industry overall if an ISBN was associated with every last eBook. This may very well explain why they push the angle that every version of every book needs an ISBN. However, there’s really little to no benefit to the individual author or publisher and given the exorbitant cost of obtaining an ISBN, it’s hard to see where the justification is. Our registration fee is an administration charge for new publisher listings. When a new publisher is added to our database we need to confirm, verify and edit the publisher information which has been submitted. The publisher details are then linked to all the appropriate Bowker products for maximum exposure. As the ISBN Agency we are entitled to recover costs for the administration of ISBN applications. I think you will find that Bowker has made significant investments in developing and refining systems over the last decade which have been aimed at enhancing the discoverability and quality of metadata supporting title listings. My Identifiers represents the culmination of that decades work and investment, which is the envy of many agencies around the world and has contributed significantly to Australian content being discoverable globally. As part of a marketing strategy I would consider our fees to be a fair and reasonable charge. Any information found on our website is reflective of the International ISBN Agency guidelines which states that different formats of a particular title can have an ISBN attached and for maximum exposure and discoverability we would recommend that they should. I don’t know about you but I remain unconvinced. Someone (it isn’t hard to figure out who) is making an absolute fortune from selling very expensive ‘numbers’. It’s clearly in their best interest to maintain a demand and perhaps asserting that everyone needs an ISBN for everything is their way of doing that. I don’t buy it but I’ll let you be the judge. So, do you need an ISBN for your eBook? No, you don’t. I wrote this blog article in early 2017. Although all my books have been published independently, and all of the above information applies, I've since discovered a particular scenario in which an ISBN is required for an eBook. If you want your book to be published wide, I.e., distributed to all the major retailers with no exclusivity, you can upload it to all the major retailers, like Apple, Amazon, B&N, etc., manually. In that event, none of the retailers requires an ISBN to accompany your eBook. If you do this, you will need to track the progress of your book sales individually through each of those retailers. This is certainly doable but can be a bit of a hassle. Note that the ISBN is required for accurate sales reporting - such as what we provide on the Daily Sales and Sales & Payment Report pages - from our retailers. Because the information is provided by our retail partners and then the detailed reports are uploaded directly into our system, ISBNs allow such information to be easily and accurately tracked by our partners and then uploaded by us. As stated previously, you can claim an entirely free ISBN that we provide via Dashboard > ISBN Manager, but if you really do not want an ISBN for your books, you will need to upload to the various retail sites directly yourself, as they require ISBNs from books distributed by Smashwords and other distribution services (in contrast to publishers that are often uploading directly). As they point out, they will provide you a free ISBN, so this will at least save you the cost of acquiring your own. So my original conclusion still holds but perhaps I should slightly modify the original question. Do you need to buy an ISBN for your eBook? No, you don't. Thanks you for the article, it really helped me. Thanks so how do I protect my ebook from copying then? Hi Nadsk. Thanks for your great question. I often get asked about piracy of my eBooks. Although there are ‘some’ things you can do to try to combat pirated versions of your eBook, such as sending DMCA take-down notices to the offending websites or requesting they be removed from Google, etc., there’s actually little benefit to spending a lot of time and energy on this. It’s entirely possible that your eBook may be pirated and the truth is there is very little you can do about it. The fact is that those that access your book via pirated copies are not going to buy it in the first place, so there’s an argument to be that you’re not loosing any money, although I’m sure that doesn’t make it any less palatable for you. Also, the more people that read your book, the better is it for you in the long run. Either way, the issue of piracy isn’t really related to ISBNs. If Smashwords give you a free ISBN can they take royalties from your book sales? Although Smashwords do charge a fee for their service, it’s not related to the use of the ISBN either way. In other words, it’s not costing you any more than it would do just because you are using a Smashwords ISBN. The two things (royalties & ISBNs) are completely separate and unrelated to each other.